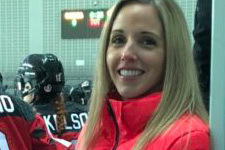 Leanne Peters may not be strapping on skates at the Winter Olympics in Pyeongchang, but as the team doctor for the Canadian Women’s hockey team, she can’t help but feel the same national pride. Moments like the round of applause that erupts from passengers when the airplane captain announces the team is on board, or the small-town rinks that have standing-room-only crowds watch practices. The women look to reassert their dominance as Olympic champs after bringing home gold in 2014 at the Sochi Olympics with a thrilling 3-2 overtime win against the United States in the gold medal game. Women’s Hockey will be held Feb. 10-22 between eight qualifying countries – Canada, United States, Finland, Russia, Sweden, Switzerland, Japan and South Korea. Under a special agreement with the International Olympic Committee (IOC) and the International Ice Hockey Federation, 12 North Korean players will join the host team to form a united team. Canada will take on Russia – known for these Games as Team OAR (Olympic Athletes from Russia) – Sunday night in its Olympic opener. While the Stratford family medicine and sports medicine doctor understands she has a job to do in South Korean, Peters admitted the experience will be exhilarating and overwhelming to take in. Peters has worked with Hockey Canada’s Women’s program since 2008, when she was doing a fellowship at the Fowler Kennedy Sport Medicine clinic at Western. Over the past 10 years, she has have worked with all three of the National Women’s hockey programs, traveling to with the U18 and Senior National teams to international tournaments in Switzerland and Germany. The Olympics is a much larger stage and, consequently, has been much more demanding time-wise leading up to, and at, Pyeongchang. The support staff is fully integrated into the team’s daily schedule and, as team doctor, Peters is leading her group which includes two athletic therapists, a massage therapist, a sport psychologist and a strength and conditioning coach. They work in collaboration to monitor diet, supplements, fitness levels, signs of fatigue or overtraining and hydration levels. “I provide routine family medicine care and immunizations, as well as the sport medicine role of assessing and managing injury, working closely with the GM and head coach, to guide return to play plans for injured players,” she explained. Anticipating the Olympic atmosphere to be unparalleled, Peters hopes she’ll always be able to remember the patriotic feeling of being part of a team representing an entire country.